Agriculture Outlook Event: 7:30 a.m. to noon, UNOH Event Center, 1450 N. Cable Road, Lima. Register at 419-222-6045, www.limachamber.com or Chamber of Commerce office. $25. LIMA — Allen County’s sixth annual Agriculture Outlook Event will be from 7:30 a.m. to noon Thursday, Feb. 7, at the UNOH Event Center, 1450 N. Cable Road, Lima. The three key speakers will be Andrea Flowers, organization merchant with Cargill; Greg LaBarge, agronomic systems field specialist with Ohio State University, and Ben Brown, farm management program manager with OSU. Registration is required. Register with the Chamber of Commerce at 419-222-6045, www.limachamber.com or at the office. Breakfast is included with the $25 registration fee. 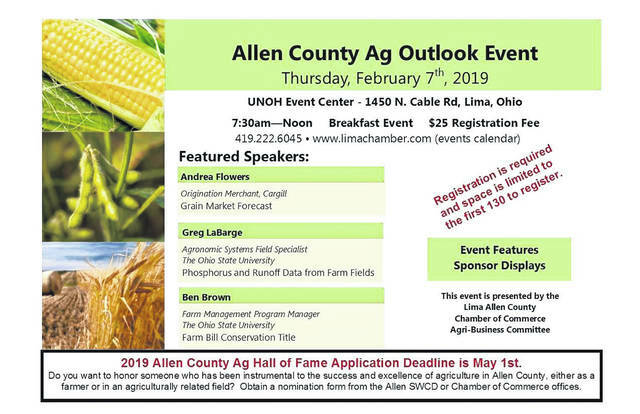 Reservations are now being accepted for Allen County’s sixth annual Agriculture Outlook Event on Thursday, February 7th at the UNOH Event Center in Lima. The target audience is farmers but this program will interest agribusiness professionals as well. The morning event features three key speakers. Andrea Flowers, Origination Merchant with Cargill will speak on the grain market forecast. Greg LaBarge, Agronomic Systems Field Specialist with The Ohio State University will be presenting research findings regarding phosphorus field losses. A Farm Bill update will be given by Ben Brown, Farm Management Program Manager with The Ohio State University. There will also be sponsored exhibits from various agribusiness professionals. The 2012 Census of Agriculture reported 7,379 individual farm operations in the eight county Greater Lima Region. With over $2 billion in annual crop and livestock sales, production agriculture is the region’s largest industry. Farms occupy over 82% of the land base. “So it’s only natural for the Lima/Allen County Chamber of Commerce to reach out to the producers in this important industry and talk about market strategies, legislative issues, and environmental impacts”, reports Chamber Agri-Business Committee Chair, Beth Seibert. Those wishing to participate in this event are required to register through the Chamber office at 144 S. Main Street in Lima, by calling them at 419-222-6045, or through their website at http://www.limachamber.com/ in the events calendar. The registration fee is $25 per person and space is limited to 130 attendees. The program is being conducted from 7:30 am to Noon on February 7th with breakfast being included. The program is open to any interested person regardless of their being located within or outside Allen County.